That’s the vision. We’re not there yet, but we are on the way and it’s a combo of permaculture principles and Holistic Management that will get us there. To listen to an ABC radio interview on our farming philosophy click here. Quoting the good people at Inside Outside Management , holistic management is a decision-making framework that ensures our decisions are economically, environmentally and socially sound i.e. the triple bottom line. So what does that mean on the ground here at Girragirra? It means a good plan that’s constantly reviewed against outcomes and a BIG dose of plain old fashioned hard yakka! Coming to Girragirra toward the end of the Millennium drought meant we were faced with a pretty blank canvas. While the soil is fertile flood plain alluvial clay, it had been bare for a long time and consequently short of organic matter, which for a number of reasons makes it fairly hostile to new plant establishment. So, first up a biodiversity planting of around 4,500 native trees and shrubs in 2011. Everything we do on the farm will benefit from its ongoing effects. Here’s a tip: Never ask a farmer if they need help tree planting, eh Phil? “Naturalistic swathes” was the planting pattern and it’s beautifully awkward to fence but we’re getting there, with very lightweight inexpensive 3 wire electric fencing using recycled vineyard posts as strainers and stays. We’ll then make small temporary paddocks as we go, using moveable electric fencing so we can graze the paddocks in a way that will regenerate our grassland. Sounds complicated? Not really. “Traditionally, livestock is kept in paddocks for weeks or months. They nibble away at the most nutritious plants, giving the noxious weeds an advantage, destroying biodiversity and profitability. A new approach, holistic management, reverses this. The mobs are moved from one small paddock to another, as often as every day. The livestock eat everything in that paddock, but over the following months the pasture is rested and the grass grows back luxuriant and sweet. Stock are better fed, less worried by parasites (because the moving disrupts the parasite cycle), calmer and seemingly happier (perhaps because the animals live in a more natural herd structure).Farmers are happier, too, because their workload is more evenly spread and their businesses are more profitable”. As broad acre farmers in the not too distant past, we found that to be true and know this method of grazing will take Girragirra forward. We’ll keep you posted! 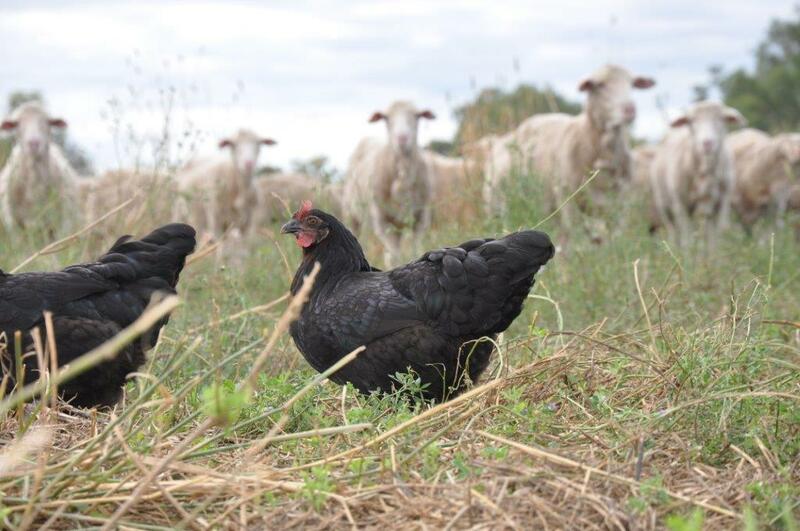 Obviously we’ve had a bit of fun with this one, however the principle of small paddocks with frequent moves is as sound for chooks and the land they occupy as it is for any other grazing animal. Portable electric feathernet fencing means we can tow the ChookVan to a fresh bit of country and quickly set up the fence, powering it with a solar panel that sits on the roof of the van. The chooks can then free range without becoming dinner for a hungry fox, or dog, eh Sally Muffet? If you want a first – hand account of the efficacy of the fence, just ask Sally Muffet, retired kelpie working dog. Sal got zapped and won’t even look at the chooks. She’s convinced they have magical electrical powers. Anyway, the end result is delicious naturally golden yellow eggs full of health giving omega 3 fats; healthy chooks, happily doing whatever it is chooks like to do with their day and a regenerating landscape: win/win/win. If you’re interested in coming along for the ride, sign up for our blog here. It’s going to be fun!